The territories of the member states of the European Union (European Communities pre-1993), animated in order of accession. Territories outside Europe and its immediate surroundings are not shown. In December 1995, the Madrid European Council revised the membership criteria to include conditions for member country integration through the appropriate adjustment of its administrative structures: since it is important that European Community legislation be reflected in national legislation, it is critical that the revised national legislation be implemented effectively through appropriate administrative and judicial structures. Finally, and technically outside the Copenhagen criteria, comes the further requirement that all prospective members must enact legislation to bring their laws into line with the body of European law built up over the history of the Union, known as the acquis communautaire. Today the accession process follows a series of formal steps, from a pre-accession agreement to the ratification of the final accession treaty. These steps are primarily presided over by the European Commission (Enlargement Commissioner and DG Enlargement), but the actual negotiations are technically conducted between the Union's Member States and the candidate country. Before a country applies for membership it typically signs an association agreement to help prepare the country for candidacy and eventual membership. Most countries do not meet the criteria to even begin negotiations before they apply, so they need many years to prepare for the process. An association agreement helps prepare for this first step. In the case of the Western Balkans, a special process, the Stabilisation and Association Process exists to deal with the special circumstances there. When a country formally applies for membership, the Council asks the Commission to prepare an opinion on the country's readiness to begin negotiations. The Council can then either accept or reject the Commission's opinion (The Council has only once rejected the Commission's opinion when the latter advised against opening negotiations with Greece). If the Council agrees to open negotiations the screening process then begins. The Commission and candidate country examine its laws and those of the EU and determine what differences exist. The Council then recommends opening negotiations on "chapters" of law that it feels there is sufficient common ground to have constructive negotiations. Negotiations are typically a matter of the candidate country convincing the EU that its laws and administrative capacity are sufficient to execute European law, which can be implemented as seen fit by the member states. Often this will involve time-lines before the Acquis Communautaire (European regulations, directives & standards) has to be fully implemented. Population and GDP per capita of individual EU member states compared with those of non-member states in Europe. A chapter is said to be closed when both sides have agreed it has been implemented sufficiently, however it can still be re-opened if the Commission feels that the candidate has fallen out of compliance. To assess progress achieved by countries in preparing for accession to the European Union, the European Commission submits regular reports (yearly) to the European Council. These serve as a basis for the Council to make decisions on negotiations or their extension to other candidates. Once the negotiations are complete a treaty of accession will be signed, which must then be ratified by all of the member states of the Union, as well as the institutions of the Union, and the candidate country. Once this has been completed it will join the Union on the date specified in the treaty. The entire process, from application for membership to membership has typically taken about a decade, although some countries, notably Sweden, Finland, and Austria have been faster, taking only a few years. The process from application for association agreement through accession has taken far longer, as much as several decades (Turkey for example first applied for association in the 1950s and has yet to conclude accession negotiations). The following is an example of an accession process—Estonia's path to membership from the 2004 enlargement. Ease of accession depends on the state: how integrated it is with the EU before hand, the state of its economy and public institutions, any outstanding political issues with the EU and (historically) how much law to date the EU has built up that the acceding state must adopt. This outline also includes integration steps taken by the accession country after it attains membership. 1991 20 August Restoration of independence from USSR Recognition from EU in same month. 2002 December All chapters closed and negotiations concluded Final chapter (No. 30) was opened and closed at the same time. Enlargement has been one of the EU's most successful foreign policies, yet has equally suffered from considerable opposition from the start. French President Charles de Gaulle opposed British membership. A later French President François Mitterrand opposed Greek, Spanish and Portuguese membership fearing that the former dictatorships were not ready and it would reduce the union to a free-trade area. The reasons for the first member states to apply, and for them to be accepted, were primarily economic while the second enlargement was more political. The southern Mediterranean countries had just emerged from dictatorships and wanted to secure their democratic systems through the EEC, while the EEC wanted to ensure the same thing and that their southern neighbours were stable and aligned to NATO. These two principal forces, economic gain and political security, have been behind enlargements since. However, with the recent large enlargements in 2004, public opinion in Europe has turned against further expansion. It has also been acknowledged that enlargement has its limits; the EU cannot expand endlessly. Former Commission President Romano Prodi favoured granting "everything but institutions" to the EU's neighbour states; allowing them to co-operate deeply while not adding strain on the EU's institutional framework. This has in particular been pushed by France and Germany as a privileged partnership for Turkey, membership for which has faced considerable opposition on cultural and logistical grounds. European Communities and European Union depending on date. The European Coal and Steel Community (ECSC) was proposed by Robert Schuman in his declaration on 9 May 1950 and involved the pooling of the coal and steel industries of France and West Germany. Half of the project states, Belgium, Luxembourg, and the Netherlands, had already achieved a great degree of integration amongst themselves with the organs of Benelux and earlier bilateral agreements. These five countries were joined by Italy and they all signed the Treaty of Paris on 23 July 1952. These six members, dubbed the 'inner six' (as opposed to the 'outer seven' who formed the European Free Trade Association who were suspicious of such plans for integration) went on to sign the Treaties of Rome establishing two further communities, together known as the European Communities when they merged their executives in 1967. In 1962, Spain, ruled by the military dictator Francisco Franco, issued its first attempt to join the European Communities. Spanish Foreign Affairs minister Fernando María Castiella sent the request form to French Prime Minister Maurice Couve de Murville. This request was rejected by all the member countries in 1964; Spain was not a democracy at the time, and thus unable to enter the EEC. The Community did see some loss of territory due to the decolonialisation occurring in their era. Algeria, which was an integral part of France, had a special relationship with the Community. Algeria gained independence on 5 July 1962 and hence left the Community. There was no enlargement until the 1970s. The United Kingdom, which had refused to join as a founding member, changed its policy following the Suez crisis and applied to be a member of the Communities. Other EEC members were also inclined to British membership on those grounds. French President Charles de Gaulle vetoed British membership. "For my part, I have no doubt at all that the discussions which we have had will prove of real and lasting benefit, not only to Britain and France, but to Europe as a whole." As part of the deal for British entry, France agreed to allow the EEC its own monetary resources. However France made that concession only as Britain's small agriculture sector would ensure that Britain would be a net contributor to the Common Agricultural Policy dominated EEC budget. Applying together with the UK, as on the previous occasions, were Denmark, Ireland, and Norway. These countries were so economically linked to the UK that they considered it necessary to join the EEC if the UK did. However the Norwegian government lost a national referendum on membership and hence did not accede with the others on 1 January 1973. Gibraltar joined the Community with the United Kingdom at this point, as can be seen in the long title of the UK European Communities Act 1972. The next enlargement would occur for different reasons. The 1970s also saw Greece, Spain, and Portugal emerge from dictatorship. These countries desired to consolidate their new democratic systems by binding themselves into the EEC. Equally, the EEC was unsure about which way these countries were heading and wanted to ensure stability along its southern borders. However François Mitterrand initially opposed their membership fearing they were not ready and it would water the community down to a free trade area. Greece joined the EU in 1981 followed by Spain and Portugal in 1986. The year 1985, however, saw the first time a territory voted to leave the Community, when Greenland was granted home rule by Denmark and the territory used its new powers and voted to withdraw from the Community (See member state territories). Morocco and Turkey applied for membership in 1987. Morocco's application was turned down as it was not considered European, while Turkey's application was considered eligible on the basis of the 1963 Ankara Association Agreement, but the opinion of the Commission on the possible candidate status was by then negative. Turkey received candidate status only in 1999 and began official membership negotiations in 2005, which are still in progress as of 2018. After the 1970s, Europe experienced an economic downturn which led to leaders launching of the Single European Act which set to create a single market by 1992. The effect of this was that EFTA states found it harder to export to the EEC and businesses (including large EFTA corporations such as Volvo) wished to relocate within the new single market making the downturn worse for EFTA. EFTA states began to discuss closer links with the EEC despite its domestic unpopularity. Austria, Finland, and Sweden were neutral in the Cold War so membership of an organisation developing a common foreign and security policy would be incompatible with that. With the end of the Cold War in 1989, that obstacle was removed, and the desire to pursue membership grew stronger. 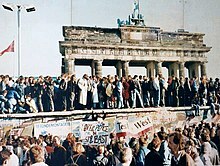 On 3 October 1990, the reunification of East and West Germany brought East Germany into the Community without increasing the number of member states. The Community later became the European Union in 1993 by virtue of the Maastricht Treaty, and established standards for new entrants so their suitability could be judged. These Copenhagen criteria stated in 1993 that a country must be a democracy, operate a free market, and be willing to adopt the entire body of EU law already agreed upon. Also in 1993 the European Economic Area was established with the EFTA states except Switzerland. Most of the new EEA states pursued full EU membership as the EEA did not sufficiently satisfy the needs of their export based corporations. The EU has also preferred these states to integrate via the EEA rather than full membership as the EEC wished to pursue monetary integration and did not wish for another round of enlargement to occupy their attention. However, with the EEA's credibility dented following rejection by businesses and Switzerland, the EU agreed with full membership. This was more readily accepted with the prospect of poorer countries wishing to join; contributions from richer countries would help balance the EU budget. On 1 January 1995 Austria, Finland, and Sweden acceded to the EU marking its fourth enlargement. The Norwegian government lost a second national referendum on membership. As with the Mediterranean countries in the 1980s, the countries in Central and Eastern Europe had emerged from dictatorships and wanted to consolidate their democracies. They also wanted to join the project of European integration and ensure they did not fall back into the Russian sphere of influence. The EU and NATO offered a guarantee of this, and the EU was also seen as vital to ensuring the economic success of those countries. However, the EU's desire to accept these countries' membership applications was less than rapid. The collapse of communism came quickly and was not anticipated. The EU struggled to deal with the sudden reunification of Germany with the addition of its poorer 17 million people and, while keeping its monetary union project on track, it was still at that early stage pointing the EFTA countries in the direction of the EEA rather than full membership. States in Central and Eastern Europe persisted and eventually the above-mentioned issues were cleared. The US also pressured the EU to offer membership as a temporary guarantee; it feared expanding NATO too rapidly for fear of frightening Russia. Although eventually trying to limit the number of members, and after encouragement from the US, the EU pursued talks with ten countries and a change of mind[clarification needed] by Cyprus and Malta helped to offset slightly the influx of large poorer member states from Central and Eastern Europe. In the end, eight Central and Eastern European countries (the Czech Republic, Estonia, Hungary, Latvia, Lithuania, Poland, Slovakia, and Slovenia), plus two Mediterranean countries (Malta and Cyprus) were able to join on 1 May 2004. This was the largest single enlargement in terms of people, and number of countries, though not in terms of GDP. The less developed nature of these countries was of concern to some of the older member states. Some countries, such as the UK, immediately opened their job market to the accession states, whereas most others placed temporary restrictions on the rights of work of the citizens of these states to their countries. The movement westward of some of the labour force of the newly acceded countries that occurred in the aftermath of the enlargement initially spawned clichés among the public opinion and media of some western countries (such as the "Polish plumber"), despite the generally conceded benefit to the economies concerned. The official EU media (the speeches of the European Commission) frequently referred to the enlargement to the CEE region as "an historical opportunity" and "morally imperative", which reflected the desire of the EU to admit these countries as members, even though they were less developed than the Western European countries. Following this Romania and Bulgaria, though were deemed initially as not fully ready by the Commission to join in 2004, acceded nevertheless on 1 January 2007. These, like the countries joining in 2004, faced a series of restrictions as to their citizens not fully enjoying working rights on the territory of some of the older EU members. Bulgaria and Romania are not yet members of the Schengen area; however, their citizens can travel visa-free to the other EU countries. The socio-economic research on the attitudes towards the integration from both hosting and visiting countries has revealed divergent views.The analysis shows, there are a number of possible factors of the rationalization and understanding of the practices on what the enlargement has been and should be like. Attitudes of even skeptical citizens, do not discard the possibility on future sustainable enlargements. The years subsequent to the EU accession will lead to extensive dialogues between policy-makers, governments, and European citizens about the path for a constructive development. The 2003 European Council summit in Thessaloniki set integration of the Western Balkans as a priority of EU expansion. The EU's relations with the Western Balkans states were moved from the "External Relations" to the "Enlargement" policy segment in 2005. Those states which have not been recognised as candidate countries are considered "potential candidate countries". The move to Enlargement directorate was a consequence of the advancement of the Stabilisation and Association process. Croatia joined on 1 July 2013, following ratification of the 2011 Accession Treaty by all other EU countries. Albania and the several successor states of the Socialist Federal Republic of Yugoslavia have all adopted EU integration as an aim of foreign policy. Article 49 of the Maastricht Treaty (as amended) says that any European state that respects the "principles of liberty, democracy, respect for human rights and fundamental freedoms, and the rule of law", may apply to join the Union. The Copenhagen European Council set out the conditions for EU membership in June 1993 in the so-called Copenhagen criteria (see Criteria above for details). The Western Balkan states had to sign Stabilisation and Association Agreements (SAAs) before applying for membership. Turkey applied for membership in 1987. The Western Balkans have been prioritised for membership since emerging from war during the breakup of Yugoslavia in the early 1990s. Albania, Montenegro, North Macedonia, Serbia, and Turkey are all recognized as official candidates, and the latter three are undergoing membership talks. Bosnia and Herzegovina and Kosovo* are recognized as potential candidates for membership by the EU. Bosnia has submitted an application for EU membership, while Bosnia and Kosovo have an SAA with the EU. In July 2014, President of the European Commission Jean-Claude Juncker announced that the EU has no plans to expand in the next five years. Juncker has described Serbia and Montenegro as front-runner candidates, and projected that they would join by 2025. On 6 February 2018, the European Commission published its expansion plan, which covers the six Western Balkan countries. The plan envisages that all six applicants could achieve accession as members of the European Union after 2025. In May 2018, Bulgaria—holding the rotating presidency of the Council of the European Union—hosted a summit on the Western Balkans, which aimed to facilitate accession by the six, including enhanced regional security cooperation and regional connectivity. It was noteworthy that the Summit referred to 'partners' rather than states: this reflects the issue that Kosovo is only partially recognised as a state. States that did not, in 2018, recognise Kosovo include fellow Western Balkan applicant, Serbia, and other EU members: Spain, Slovakia, Cyprus, Romania, and Greece. The European Commission is sensitive to the issue which was addressed in a speech by the EU's High Representative/Vice-President Federica Mogherini at the European Parliament Plenary Session on the Western Balkan Strategy: " shared, unequivocal, concrete perspective for European Union integration for each and every one of the six partners. Each at its own pace, with its own specificities and under different conditions, but the direction is clear and is one ". Not all enlargement negotiations have ended with the accession of a new member state. Norway completed membership negotiations twice, in 1972 and 1994, but both times membership was rejected in a referendum. Switzerland applied for membership in May 1992 but subsequently froze its application, and formally withdrew it in 2016. Iceland lodged its application following an economic collapse in 2008, but froze accession negotiations in 2013. In 2017, Iceland's newly elected government announced that it may seek to begin talks with the EU on possible future membership once again, but this did not happen as the government only survived for eight months. New elections were called in October 2017, leading to a new left–right coalition government in November 2017. Following the elections, all the parties of the governing coalition oppose EU membership, along with two of the opposition parties, summing up to at least two-thirds of the MPs. Additionally, for more than eight years every single opinion poll published in Iceland has had a solid majority against joining the EU. ^ Current Article 1 of the Treaty on European Union reads:"The Union shall be founded on the present Treaty and on the Treaty on the Functioning of the European Union. Those two Treaties shall have the same legal value. The Union shall replace and succeed the European Community". ^ "State of the Union : ROADMAP FOR A MORE UNITED, STRONGER AND MORE DEMOCRATIC UNION 2017" (PDF). ec.europa.eu. Retrieved 2017-10-02. ^ "Juncker in the 2017 State of the EU: We must maintain a credible enlargement perspective for the Western Balkans". europa.rs. Retrieved 2017-10-02. ^ "Serbia on course for EU by 2025, top EU official says". Reuters. Retrieved 2018-01-27. ^ "'They've pulled up the draw bridge' Juncker RULES OUT Turkey joining the EU". Express UK. Retrieved 2017-10-02. ^ "PRESIDENCY CONCLUSIONS : Copenhagen European Council - 21-22 June 1993" (PDF). Europarl.europa.eu. Retrieved 2016-04-21. ^ a b c d e f g "European Commission - Enlargement: Archives Country Profiles". Ec.europa.eu. Archived from the original on 3 January 2011. Retrieved 21 April 2016. ^ "EU candidate status for Albania". European Commission. 2014-06-24. Retrieved 2014-06-27. ^ "Bosnia and Herzegovina applied for EU membership today". The Netherlands EU Presidency 2016. 15 February 2016. Retrieved 15 February 2016. ^ On 3 October 1990, East Germany joined West Germany through the process of German reunification; since then, the reunited Germany has been a single member state. ^ "Iceland withdraws EU accession bid". Deutsche Welle. 2015-03-12. Retrieved 2015-03-12. ^ Iceland's Ministry of Foreign Affairs (2013-06-13). "Minister Sveinsson meets with Stefan Füle". Retrieved 2013-06-19. ^ "European Commission- Enlargement- Kosovo*". European Commission. 28 June 2013. Retrieved 28 June 2013. ^ "Chronology". European Commission. Retrieved 2014-03-09. ^ Staff writer (2006-03-22). "EU Mulls Deeper Policy Cooperation with Morocco". Defense News. Retrieved 2006-07-04. ^ European Commission (2005-11-10). "1972". The History of the European Union. Retrieved 2006-01-18. ^ European Commission (2005-11-10). "1994". The History of the European Union. Retrieved 2006-01-18. ^ The European Offensive. - Government of Castile and Leon. Retrieved 2 August 2013. ^ "EU membership application not to be withdrawn". swissinfo. 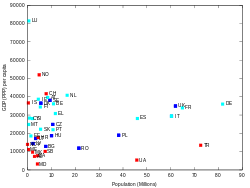 2005-10-26. Retrieved 2015-03-12. ^ British Embassy, Bern (2006-07-04). "EU and Switzerland". The UK & Switzerland. Retrieved 2006-07-04. ^ "Retirer la demande d'adhésion à l'UE et dire les choses telles qu'elles sont". Retrieved 15 June 2016. ^ "Retrait de la demande d'adhesion de la Suisse a l'UE" (PDF). Swiss Federal Council. 2016-07-27. Retrieved 2016-09-13. ^ European Commission (12 January 2015). "The Schuman Declaration – 9 May 1950". Retrieved 2016-03-11. ^ ARTEHISTORIA. "La ofensiva europea". ARTEHISTORIA. Archived from the original on 11 January 2014. ^ a b "1971 Year in Review Archived 12 February 2009 at the Wayback Machine, UPI.com"
^ "Turkey Secretariat General for EU affairs – Current situation in accession negotiations". Abgs.gov.tr. Retrieved 2016-04-21. ^ Schimmelfennig, F., Börzel, T. A., Kortenska, E., Langbein, J., & Toshkov, D. Enlargement and the Integration Capacity of the EU Interim Scientific Results. ^ "Treaty establishing the European Coal and Steel Community (Paris, 18 April 1951) - CVCE Website". Cvce.eu. 1951-04-18. Retrieved 2016-04-21. ^ "EUR-Lex - 11972B/AFI/DCL/06 - EN - EUR-Lex". Eur-lex.europa.eu. Retrieved 2016-04-21. ^ "CONVENTION portant révision du traité instituant la Communauté économique européenne en vue de rendre applicable aux Antilles néerlandaises le régime spécial d' association défini dans la quatrième partie de se traité". Euro-lex.europa.eu. Retrieved 2016-04-21. ^ a b The Netherlands Antilles dissolved on 10 October 2010 and contained the islands of Aruba (which left the Netherlands Antilles in 1986), Bonaire, Curacao, Sint Maarten, Saba and Sint Eustatius. Aruba, Curacao and Sint Maarten are autonomous countries in the Kingdom of Netherlands, and remain overseas territories of the European Union. Bonaire, St Eustatius and Saba, also known as the BES islands, are special municipalities of the Netherlands, and remained legally overseas territories. ^ "361 - An evaluation of the EU's Fifth Enlargement With special focus on Bulgaria and Romania - Fritz Breuss - Fritz Breuss, Research Institute for European Affairs (Europainstitut)and Vienna University of Economics and Business Administration - European Commission". Ec.europa.eu. 3 June 2009. Retrieved 2016-04-21. ^ a b "PROTOCOL No 1 : ON AMENDMENTS TO THE STATUTE OF THE EUROPEAN INVESTMENT BANK" (DOC). Europarl.europa.eu. Retrieved 2016-04-21. ^ "EUROPEAN COUNCIL DECISION of 29 October 2010 amending the status with regard to the European Union of the island of Saint-Barthélemy" (PDF). Eur-lex.europa.eu. Retrieved 2016-04-21. ^ "Home". Oami.europa.eu. Retrieved 2016-04-21. ^ "RECENT ECONOMIC AND FINANCIAL DEVELOPMENTS IN EU CANDIDATE COUNTRIES" (PDF). Ecb.europa.eu. Retrieved 2016-04-21. ^ "EU welcomes Croatia's 'historic moment' on eve of entry". Eubusiness.com. Retrieved 2016-04-21. ^ "EUROPEAN COUNCIL DECISION of 11 July 2012 amending the status of Mayotte with regard to the European Union" (PDF). Eur-lex.europa.eu. Retrieved 2016-04-21. ^ a b "Enlargement - Check current status". European Commission. Retrieved 2014-06-27. ^ "Better Together accused in Juncker row". Herald Scotland. ^ "Strategy for the Western Balkans". Europa: European Commission. 6 February 2018. Retrieved 18 May 2018. ^ "EU-Western Balkans summit in Sofia". Council of Europe. 17 May 2018. Retrieved 18 May 2018. ^ Martin, Dimitrov (23 April 2018). "Balkans Labeled 'Partners' Instead of 'States' for Sofia Summit". Balkan Insight. Retrieved 18 May 2013. ^ "Speech by High Representative/Vice-President Federica Mogherini at the European Parliament Plenary Session on the Western Balkan Strategy". European Union External Action Service. 6 February 2018. Retrieved 18 May 2018. ^ "EU membership application not to be withdrawn". swissinfo. 2005-10-26. Retrieved 2016-04-21. ^ British Embassy, Bern (4 July 2006). "EU and Switzerland". The UK & Switzerland. Archived from the original on 28 April 2006. Retrieved 2006-07-04. ^ Lawless, Jill (2017-01-11). "Iceland gets new govt, could restart talks on entering EU". Associated Press. Archived from the original on 2017-01-12. Retrieved 2017-03-29. ^ Gudmundsson, Hjortur J. (2017-12-11). "Iceland: further from EU membership than ever". EUobserver. Retrieved 2018-06-08. 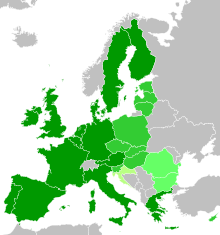 Wikimedia Commons has media related to Enlargement of the European Union.